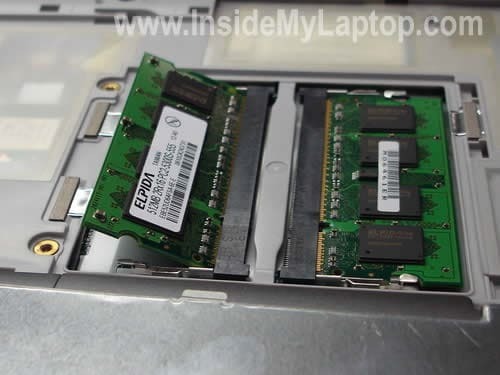 You can easily upgrade RAM to 4GB yourself; all you need is a couple of screwdrivers, two 2GB modules and 15 minutes of your time. Before you start turn off the computer, unplug AC adapter and remove the battery. Carefully insert a small flathead screwdriver under the bezel and lift it up. Continue removing the bezel with fingers. Now remove two screws and release a small plastic latch in the middle. 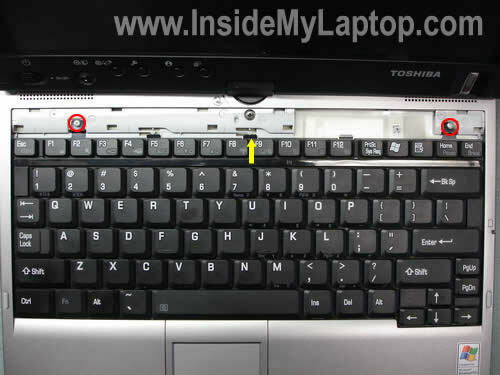 Lift up the keyboard as it show on the picture and place it upside down on the palm rest. You’ll find two covers under the keyboard. 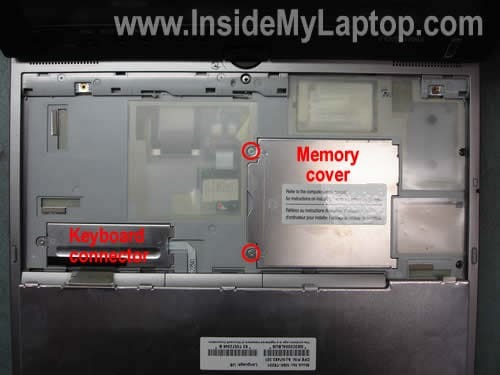 Both memory modules are hidden under the right cover. Remove two screws and remove the cover. In my case both RAM slots are occupied with 512MB modules. I’m going to remove both modules and replace them with new once. Spread latches on both sides with thumbs. The RAM module will pop up at a 30 degree angle. Carefully pull the module by the edges and replace it with a new one. Repeat three last steps with the second RAM card. 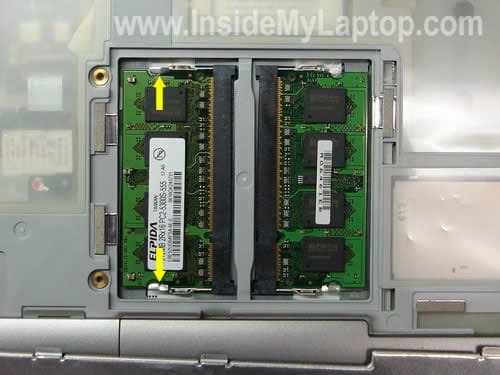 Thanks for Website its helps me a lot to open My laptop to upgrade RAM. Thanks very much — your instructions and pictures enabled me to do what I needed! Thank you so much, I have a main PC but used this laptop for my Batchelors. Now I can keep it and not fork out a load on a laptop/tablet for my masters thanks to you. THANK YOU SOOOO MUCH!!! Thanks a lot. I was having a heck of a time figuring out where to upgrade the RAM and your instructions kept me from removing every screw in the machine! Thank you so much for this. You helped me upgrade the RAM on a friend’s laptop. I appreciate the time you put into the guide. So Helpful! I just saved some money and time!!! Wow, Thanks so much Great job. Question, The screws that hold the cover to the memory slots are really tight. How much pressure downward can I put on this area? The screws that hold the cover to the memory slots are really tight. How much pressure downward can I put on this area? I’m not sure why you are experiencing a problem. 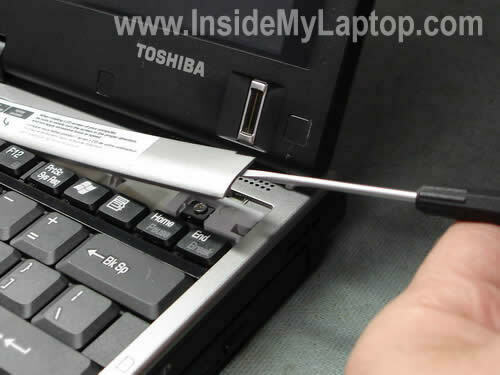 Make sure to use the right screwdriver which fits screws tightly. Thanks a lot.. It really helps me to upgrade the RAM. Hey, do you need to upgrade both with a 1 GB? I only bought one 1GB RAM module. Is that okay or do I need to replace both modules? Thank you for your guide! I followed everything to the letter but now my screen won’t work. Help? Yes, you can replace just one memory module. I followed everything to the letter but now my screen won’t work. Apparently the memory module is not installed correctly. Try reconnecting it. Also, there is a chance that your new module is bad, but I cannot tell without testing it. 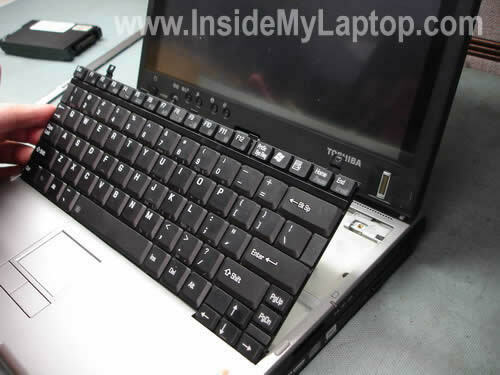 Try installing the old one back in place and test the laptop again. Thank you for your reply! I tried re-installing the old module but the screen still doesn’t work. I’m not sure what the problem is? But I haven’t killed the computer have I? Thanks so much for the information. This not only showed me how to get into my laptop, but saved me time and money. Much appreciation!!! Thanks for taking the time to do this. It is very much appreciated! You saved me hours of looking for the location of the memory! This was great, I just bought a used tablet and wanted to upgrade the memory, this link made it so easy to do. Thanks ! The only thing that’s worth doing is checking to see that your system recognizes the memory. Assuming you’re running Windows, go to Start->Control Pane->System. It should show you the amount of RAM that you think you have. Thank you, it was a snap.! Hi. Found this really good. 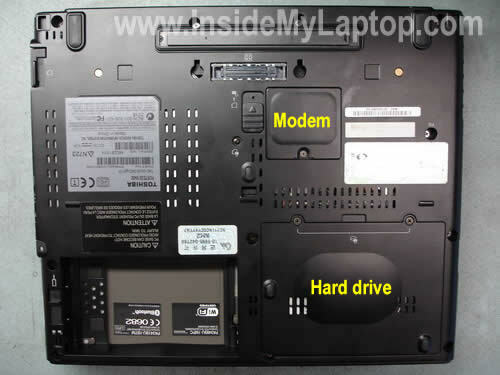 Only problem is that my model – Toshiba Portege R400 only has one slot. I replaced the existing stick with a 2gb one. System now shows me up to 3gb of RAM now. Had wanted to increase it to 4gb, is there any way of doing this? If there is only one port, what’s the maximum RAM I can go to?